Have kittens neutered before they reach sexual maturity to prevent spraying. Cleaning and smelling cat urine spray around your home can be an unpleasant experience. In 90 percent of cases, neutering eliminates this unwanted behavior in male cats, according to VetInfo. If your furbaby continues to spray urine after being neutered, another issue may be to blame, including a medical problem. Cats spray their territory, including the inside of your home, with pungent-smelling urine to send the message to other cats that the area belongs to them. Sexually mature male cats also use urine as a way to advertise to females that they are available to mate with. A mature male cat's testicles produce a hormone called testosterone that fuels his urges to mate and other aggressive behaviors, including territorial marking. Neutering involves the removal of your kitty's testicles so he can't mate and produce kittens. This procedure also eliminates the source of testosterone in his body, making him friendlier, more docile, and less likely to engage in mating behaviors, including the urge to urine mark, according to the People's Animal Welfare Society. Timing is everything when it comes to stopping urine marking in cats. 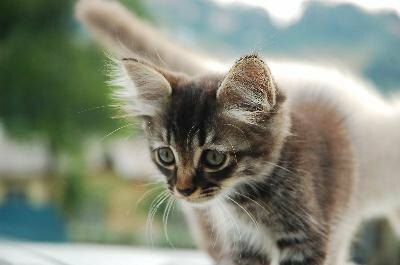 Neutering your male kitten before he reaches sexual maturity, at around 5 months of age, usually prevents urine marking from even starting, recommends the Humane Society of the United States. This also prevents the behavior from showing up later in life for most cats. Generally, the younger a cat is when neutered, the greater the chance of the procedure stopping his urge to urine mark. The reason for this is that an older cat becomes used to urine marking over time, and it becomes part of his routine. Even after the hormones spurring the behavior on are no longer present in his system, cats are creatures of habit and may continue to urine mark because of it. A cat that is currently spraying urine will typically continue this behavior for up to six months after the neutering procedure, according to VetInfo. This is due to the testosterone remaining in the cat's system. The behavior should lessen and disappear over time, but if it continues a more serious issue could be the cause. A urinary tract infection could be causing your cat's continued issues with spraying. It requires a proper diagnosis by your veterinarian and treatment with antibiotics. Other medical issues can cause your cat discomfort and stress, leading to urine marking as well. It's best to see your veterinarian to determine if an illness could be the cause of your kitty's behavior. A neutered cat will sometimes spray urine on vertical surfaces to mark his territory when under stress. If your kitty spies other, non-neutered male cats outdoors, he may become upset and spray urine to tell these cats to stay away. Simply closing your curtains to block out the sight of these outdoor cats can deter your kitty from spraying. Scoop your cat's litter box twice daily to keep it clean and use a fine clumping, unscented litter that your cat may prefer to his current one. Be sure to clean any previously marked spots in your home with pet-specific enzymatic urine cleaner. Without proper cleaning, these spots can attract your cat back to the same area to spray it again. Multiple cat households typically experience problems with urine marking because of crowding or conflicts between the cats themselves, even with neutered cats. To ease these issues, provide at least one litter box per cat, plus one, in different parts of your home, recommends the American Society for the Prevention of Cruelty to Animals. Make use of vertical space with cat condos to climb or cat shelves for them to perch upon. This gives each of your kitties plenty of spaces for them to call their own. If your furbaby has been neutered but continues to urine mark and has gotten a clean bill of health from your vet, he may require further measures to modify his behavior. In addition to altering your cat's environment to reduce his stress, you can use pheromones to calm your furbaby. Synthetic cat pheromones sprayed or diffused around your home promote a sense of well-being and tend to deter urine spraying. Spray or place plug-in diffusers in the areas previously marked by your cat for best results, recommends the ASPCA. If all other measures have failed, your veterinarian may place your cat on an anti-anxiety medication to help deter his urine marking. VetInfo: Why Is Your Cat Spraying After Neutering? Does a Cat's Pee Stop Stinking After It's Neutered? Do Male Cats Stop Urinating in the House After They're Fixed?